Swidden is often blamed for deforestation but research has shown that these traditional systems can have a role in maintaining and enhancing carbon stocks and therefore could be compatible with efforts such as payments for environmental services (PES) and Reducing Emissions from Deforestation and Forest Degradation (REDD+) schemes in Vietnam. This would require that PES and REDD+ project developers build on existing local governance structures. 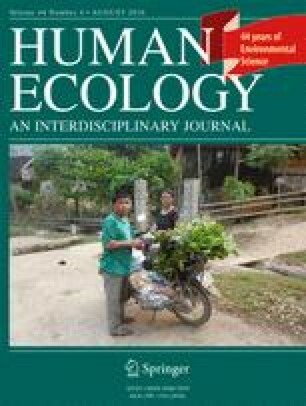 In this paper we attempt to understand such structures though analysis of information and resource exchange in two communities in Vietnam, focusing on traditional local governance guiding swidden practices, and mass organisations. Results show a high diversity of formal (government-formed networks) and informal (traditional) swidden governance structures that can be embedded in REDD+ and PES schemes, where geographical accessibility, socio-cultural practices, and capacities of government will also determine which structure will work best for swidden communities to participate in REDD+/PES. This research is part of Center for International Forestry Research (CIFOR) contribution to the ASEAN-Swiss Partnership on Social Forestry and Climate Change project coordinated by the ASEAN Social Forestry Network. We would like to express our special thanks to Christine Padoch from CIFOR for her support and comments, as well as Aneesh Anandas who produced the land-use maps. We also thank Le Manh Thang and Luong Thai Hung from Son La Forest Protection and Development Fund and Tran Binh from Con Cuong district People’s committee, and participants in Nghe An and Son La for their support during our field work.